BUY NOW, before we have to say BYE, NOW! The Retirement List for Accessories and Decorative Items is Here! It’s a long list – including almost 3 full pages of items up to 70% OFF! All of the items on this retiring Accessories & Decorative items list are available ONLY WHILE SUPPLIES LAST – so you’ll want so SHOP EARLY! SU! will be posting a list to demonstrators each day at 4:00pm of sold out items, so I will share that list with you each day. Don’t delay in your shopping – you don’t want to be disappointed! 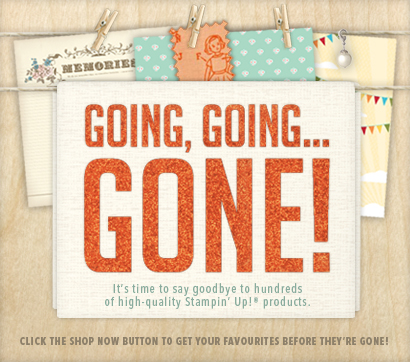 When you look at the retired accessories list, you’ll note that all of our Stampin’ Pads are listed. This is for two reasons: (1) Craft Stampin’ Pads will now only be available in black and white; and (2) we are introducing a new Firm Foam pad in our Classic Stampin’ Pads with the 2012-2013 annual catalogue. The Firm Foam pads offer better ink coverage and, in turn, better stamped images. So, if you use a lot of the 12″x12″ card stock for your card making or scrapbooking, now is the time to stock up! The same with the Craft Inks, which are great for stamping on fabric, tiles, and embossing – they will only be available in black & white after this. All five colours of the reformulated inks have been fully tested and approved. While using the new ink formula in the old Stampin’ Pads is fine, we do not recommend using the old ink formula in the new firm foam pads. Any refills purchased after April 30, 2012, will contain the new formulated ink. Remember my personal special offer – place an order of $75 or more (before S/H) before April 30th and get 15% off your total order! This offer is only through me, so you must contact me -either email debsmart@shaw.ca or phone 604 298 0472 – to place your order. What are you waiting for – go shopping!! Click the Retiring Items button on my sidebar (left) to go directly to the SU! page of retiring items, browse & make your list, then get back to me! Previous Previous post: Occassions Mini Almost Over!